"great image - very impressed with the range"
"I use the Telesend on broadcast documentary shows like ITVs Tonight and Countrywise and I give it to the directors." "It has a great image – very clear with great clarity in bright sunlight and I'm very impressed with the range." "We recently used it on a stage at Brighton with the HD-SDI output going into a giant screen, which worked really well - no problems." "A couple of times I’ve had to use an older camera with a composite output and that is why I have the transmitter version with the composite input as well as HD-SDI. 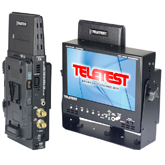 So in this case, even though the input I am using to the transmitter is composite, the output from the monitor is HD-SDI, which is perfect for my needs."